When it comes to delivering online video, content owners continue to need more services than just pushing bits across a network. The real struggle moving forward is trying to solve the entire ecosystem of video creation, ingestion, transcoding, management, storage, distribution and tracking. Not to mention all of the other sub-categories of management like authentication, meta data, business rules, etc. 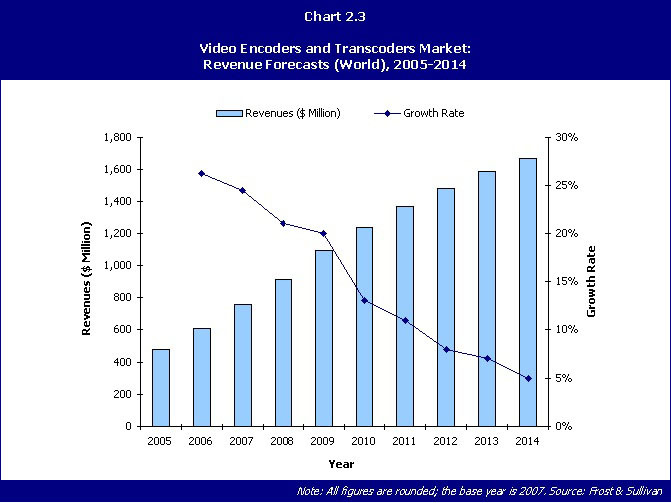 The question I often get asked is who’s in the transcoding market and what segments of the market are they going after? In a recent conversation I had with Ripcode, they shared with me one of their slides that breaks out the different vendors in the market and the segments or verticals each vendor is going after. 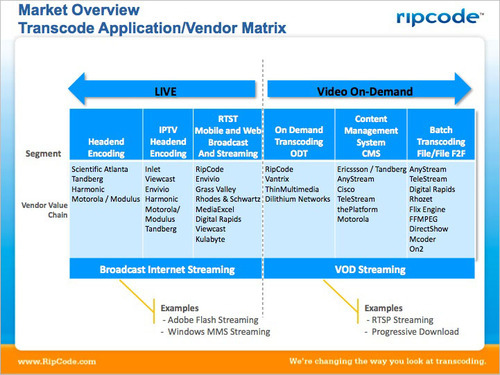 While I am sure there are a few more vendors that could be listed, especially for mobile transcoding, the slide does a good job of capturing who’s in the market today and what they are focusing on. While transcoding is a small market today, it’s only going to grow larger as more content owners place more videos online, in more formats, for more devices. Over time, transcoding is going to become a mainstay functionality of the CDNs and we are already beginning to see more content delivery networks think about the ecosystem for video, including transcoding. In addition, some content owners have the ability and resources to do their own transcoding and for some, it makes sense to keep it in-house. The transcoding solutions on the market today are a lot cheaper and more efficient than they were three or four years ago and provide the ability to turn around videos very quickly for content owners who have the internal manpower. Last year, Frost & Sullivan released a report entitled "Video Encoders and Transcoder Market" which contains a slide that shows the revenue forecasts and growth rate for 2005-2014.
digitization becomes well established globally over the forecast period. While transcoding is not a service you hear many people talking about in the industry, it is a topic that you hear raised quite often when speaking to a large number of customers. Over time, transcoding should become a technology that is built into the network layer of content delivery and hopefully will be seen less as a stand-alone product offering. The key thing to remember is that if content owners can’t get their video into the right format, for the right device, they content can’t be delivered.